You never be too rich or have too many clamps. Here’s another to add to your collection; it’s the love child of a squeeze trigger clamp and a traditional bar clamp. The result: bar clamp reach with one-handed trigger simplicity. Jorgensen’s claims that their design offers substantially more clamping force than other bar clamps in its class. 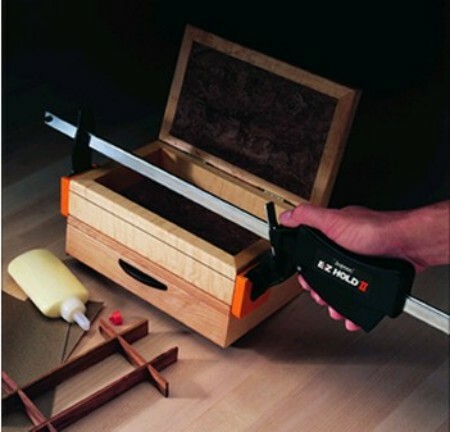 Their new clamps offer a 3-1/2” reach with openings ranging from 10” to 54”, so you can use this for a ton of woodworking projects. The head is also reversible — as is common in this class — so you can use it as a spreader, too. The handle is made of glass-filled nylon, which makes it both light weight and (relatively) strong while the bars are high-carbon steel. Street pricing ranges from about $15 for a 10” clamp to about $25 for the larger sizes. I’ve had a set of these for 15+ years and I love them. Most quick grip type clamps don’t have any spring action in their design like these do and they’re reversible too. I’ve managed to break 2 of them and I’m always on the lookout for them at yard sales and such. I’m trying very hard to find these clamps and have had no luck. After weeks of searching ,the only reference to them has been your article. Can you direct me to the website where I can purchase several of the sizes? I have the E-Z Hold Clamp and i’m tryng to understand how to cnfigure it for “spreader clamp”. Do you a pictorial diagram to do this? I have the same problem that P. Dice has. Was an answer ever received and if so, may I have that information? I have just assembled a wolfclamp complete with springs etc and it workes fine. Can anyone show me how to reassemble a Jergensen EZ Hold II? I to have a E – Z hold 2 bar clamp, that has come to pieces, can anyone help, please! where can I boy many clamps? 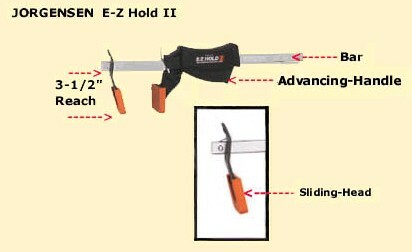 I need 40x in mini format “Jorgensen MINI E-Z HOLD II” and 10x in large format (for example 3-1/2” reach with openings ranging from 10” to 54” like on the picture above).